My husband, Bryan, and I brought our sons to the mountains from an early age, strapping small packs on them and the dog for slow hikes to local campgrounds. Ben and Noah loved whittling sticks, playing in the stream, and roasting marshmallows while watching “campers’ TV” in the fire pit. 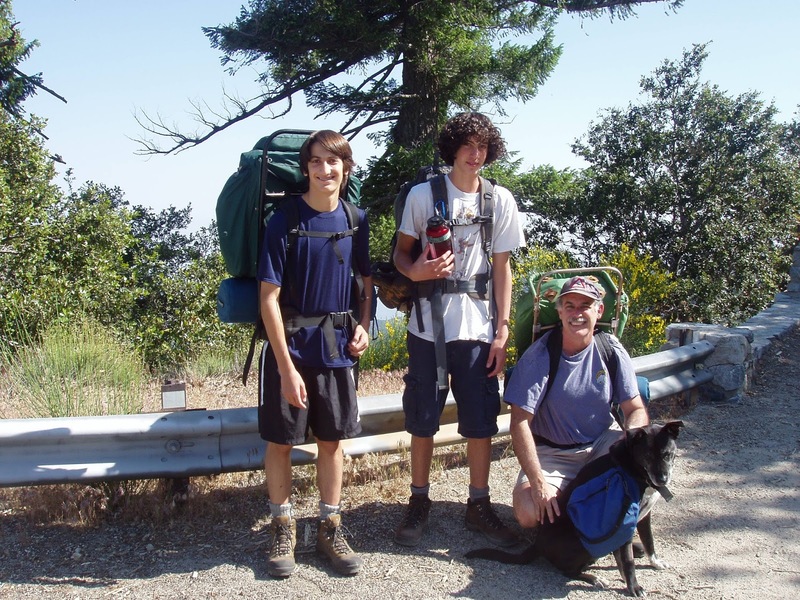 As a teenager, Noah (center) went backpacking with his dad, best friend Sammy, and Wags, and with youth wilderness organizations in California and the Northwest. He played hackey sack on the summit of Mt. St. Helens, then slid down the steep scree. He admired the peripatetic leaders of the youth trips, who could survive anywhere and converse with anyone as they traversed the back country. Last week, it was Noah’s legacy that brought Bryan and me to the mountains. Our mission was to meet staff and students from Outward Bound California at “Helipad 2.0,” a huge granite slab near Wishon Lake in the Sierras. We’d been invited because of the Noah Langholz Remembrance Fund has been helping support scholarships for the organization. We knew we were in the right place when we saw a row of dusty bear canisters and a circle of dirty, enthusiastic teenagers who’d just emerged from two weeks of backpacking. They were fantasizing about good food and cellphones but had managed fine without either and formed a tight group in the process. We listened to their stories and pitched in with cooking, clean-up, and the impressive drill of “de-issuing” gear like helmets, spices, and blister kits. The director told the students that “the real adventure begins now” with what they’d learned about themselves and others. The air fairly crackled with the optimism and energy of young people with their whole lives before them. As Noah should have been, I couldn’t help thinking. From our shady campsite, Bryan and I looked down on lakes and forests we’d never seen before. The air was fresh and piney, the river below a rollicking torrent. A slip of moon in indigo sky gave way to stars so thick and close, they looked fuzzy. We were here, exploring new vistas in the Sierras and meeting these great people, because of Noah. At least there’s that to be grateful for, and future trips with our son, Ben, even if we’ll never again share a campsite or anything else with Noah. We left the mountains in time to spend Noah’s should-have-been 26th birthday at home. We brought a foot-long Jeffrey pine cone to place on his rock in the Children’s Memorial and Healing Garden, along with a rose and an apple from a tree he planted in our yard shortly before his death. That tree bears sweet fruit now, 4 ½ years later. Bryan’s new corn crop is a marvel. After so much hurt--I had a can't-stop-crying/shaking fit the day before the Outward Bound meet-up--what can we survivors do but continue to seed the ground and treasure what harvest comes to us?